Messages from Spirit is a Group Psychic-Medium Reading Event which offers a warm, inviting, community environment whereupon each person receives the benefit of communing with Spirit by hearing and/or receiving messages. Messages from Spirit features Psychic Medium Jennifer Garcia, Founder of Spiritual Spectra, providing predictions and channeled messages from loved ones in Spirit, Spirit Guides & Angels. Messages from Spirit is a warm community environment to connect with your loved ones here and beyond. The ticket price is $30, plus online registration fee when paying by debit/credit card. You can also pay in cash the day of the event. No checks accepted. Questions? 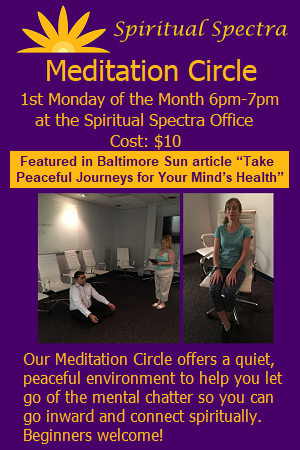 Contact us at info@spiritualspectra.com or 1-888-934-3642 (toll-free). Age: You must be at least 18 years of age. Taking Notes: Participants are free to take notes to be able to refer back to in the future; however, no recorders please. Intent: We ask participants to come to this event with an open mind and loving energy; and accept that what is being shared is for their greater good. We ask participants to understand that when a Medium is channeling Spirit she functions much like a language interpreter, what she says is what is being communicated to her by loved ones in Spirit, Spirit Guides and Guardian Angels. In some cases, what is shared may be hard to hear, but please always be respectful to the Medium who is simply doing her best to share what is being communicated to her. Conduct: This is a group event so please be respectful and courteous to our presenter and participants. Spiritual Spectra reserves the right to ask any participant to exit and not return if their rude, surly, negative, disrespectful, inappropriate or harmful behavior interrupts the Medium process and/or the comfort of other participants. No refunds will be given. Cancellation Policy: Should events be canceled due to snow or other reason, those who have already registered and paid will be rolled over to a future date of their choosing. Payment Policy: There are no refunds. Should a participant pay in advance for an event and not be able to attend, they can attend on one future date of their choosing. Disclaimer: Spiritual Spectra cannot guarantee that the loved ones in Spirit that come through are the ones you most wish to speak to, because the Spirit world cannot be controlled. Spiritual Spectra facilitates communication to those Spirits who wish to communicate and who are able to reach out. We encourage our participants to call upon specific loved ones and think about them prior to an event to help make the connection but nonetheless, we cannot guarantee that those in particular will come through. Media: Spiritual Spectra reserves the right to audio or visually record the event for future use, participants will not be financially or otherwise compensated for such, although Spiritual Spectra will do its best to respect the privacy of all participants no guarantees can be made.